Made of brass and aluminum, very durable. Contains corrective glass lens. 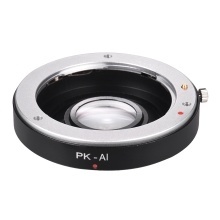 Suitable for Pentax K mount lenses to mount for Nikon AI F mount cameras, such as D700, D300, D3. Only manual focus is available. The lens mount adapter is manual so focusing will have to be preset.